Two Central Reserve Police Force (CRPF) personnel were killed when an improvised explosive device (IED) exploded while they were defusing it in Bihar’s Aurangabad district today. The state goes to the polls on April 10. A police official said two CRPF personnel were killed and five CRPF personnel and four Bihar policemen were injured when the IED went off. According to police officials, the Maoists have called for a boycott of the Lok Sabha elections and had placed the IED to create panic. The injured security men include officer-in-charge of the Dhibra police station Amar Choudhary. They have been admitted to a hospital, the police said. Following the incident, combing operations have been intensified against the Maoists in Aurangabad and neighbouring districts. The Army today successfully test fired an advanced version of 290-km range supersonic cruise missile, BrahMos, as part of a user trial at the Pokhran test range in Rajasthan. The missile was launched by a mobile autonomous launcher deployed in full configuration with mobile command post at the ranges. “The launch was successful and the missile hit the designated target,” Defence spokesperson Col SD Goswami said. Addressing the last combined conference of the senior commanders of the three services there was nothing unusual in the Indian Prime Minister’s remarks that the strategic problems have shifted from the west to the east and so have the threats and challenges. The pronounced tilt had, in fact, occurred long back after the end of the Cold War in 1991, while the post meltdown phase further intensified it. India’s security attributes in the new power structure descended into the worst kind of anarchical disorder. It was overtaken by dire poverty, economic exploitation, bad governance, inflation, population explosion, caste, religious and sectarian fundamentalism, divisive and fissiparous tendencies, terrorism and insurgency. At the same time, both Pakistan and China heightened tension along the Line of Control (LoC) and the Line of Actual Control (LAC) by assaulting Indian troops and attempting to cross the border at various times with impunity. The period immediately preceding 1991, and thereafter, had initiated a new kind of war where the adversary found it more convenient to hit strategic targets like the local population and such areas of domain falling under the C5I2SR spectrum. In fact, the Chinese and the Pakistanis had created departments long back that specialised in cyber warfare, while we are only now planning to have a dedicated new Army Cyber Command to look into the aspects of computer war gaming in a serious manner. Unaccustomed to combat cyber warfare techniques used by China and Pakistan way back in the late 1980s, the Government of India used to dismiss such electronic tactical advances as mindless and juvenile activities. How effective the new command will be to counter such cyber assaults, when the Ministry of Defence and the National Security Council Secretariat as well as a host of other important agencies had already suffered dosages of computer hacking, is yet to be comprehended. One thing that is certainly assured is the shift from positional threats to assaults that are mobile in nature. The serial bomb blasts that hit India repeatedly during the 1990s would substantially vouch for it. As a country we debated for 24 long years on whether or not to nuclear weaponise. But once we took the decision to go ahead with nuclear weapons, the policy of no first use further emboldened Pakistan to test India on three occasions – the war in Kargil, the stand off during Operation Parakram and the 26/11 terror attacks in Mumbai. Its success lay more in intensifying and fighting on all fronts like political, economic, religious and military. We have failed to address Pakistan as our enemy and seem to have developed a fear psychosis vis-a-vis China. It has resulted in losing the strategic respect we would otherwise have earned from the peripheral countries. Our bogey of strategic ties with the US must allow us to appreciate that every country fights its own war and we are no different. Non-alignment is no longer a muscular tool to establish India as a balancer or to practice neutrality in the globalised world. Let us not forget that Pakistan continues to enjoy the non-NATO membership status given to it by the United States. We have also been experiencing terrorism for the last over five decades. The country keeps debating which security agency to use or when it is politically convenient to combat terrorist activities, while military means remains the last option. We are letting our paramilitary forces conduct low intensity warfare with no clear directions. We have been unable to combat issues relating to internal security, exhibiting the Nehruvian attitude, making ourselves more active on the global front but with no commensurate military capabilities to support it. India’s security arch extends from Aden to Malacca in the Indian Ocean and now to the South China Sea. In this context, while the Indian maritime doctrine must conceive its present and future mandate in a strategically dynamic era, one attempts to analyse the role of the newly inducted aircraft carrier, INS Vikramaditya. The Indian Navy has a history of operating such carriers, but their use as an instrument of power projection remains rather questionable. For instance, INS Vikrant was commissioned in 1961 and we found it difficult to deploy during earlier wars. INS Virat was a little luckier, but what is most significant is whether we have charted any role for INS Vikramaditya at a time when the Chinese have already positioned their aircraft carrier, Liaoning, in the South China Sea. There has been a debate and ongoing scholarly work on the role of aircraft carriers in modern warfare, especially since air-to-air refueling has already enlarged the radius of action of warplanes, as have missiles for striking long distance targets. The country needs to have a policy for force projection. According to Clausewitz, it is the policy which fights and not the weapon per se. 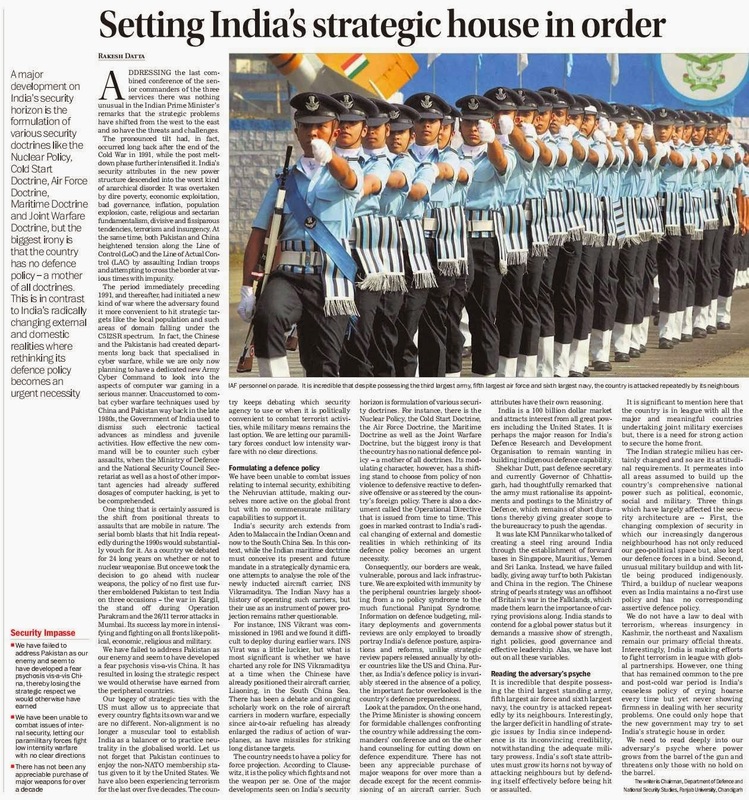 One of the major developments seen on India’s security horizon is formulation of various security doctrines. For instance, there is the Nuclear Policy, the Cold Start Doctrine, the Air Force Doctrine, the Maritime Doctrine as well as the Joint Warfare Doctrine, but the biggest irony is that the country has no national defence policy -- a mother of all doctrines. Its modulating character, however, has a shifting stand to choose from policy of non violence to defensive reactive to defensive offensive or as steered by the country’s foreign policy. There is also a document called the Operational Directive that is issued from time to time. This goes in marked contrast to India’s radical changing of external and domestic realities in which rethinking of its defence policy becomes an urgent necessity. Consequently, our borders are weak, vulnerable, porous and lack infrastructure. We are exploited with immunity by the peripheral countries largely shooting from a no policy syndrome to the much functional Panipat Syndrome. Information on defence budgeting, military deployments and governments reviews are only employed to broadly portray India’s defence posture, aspirations and reforms, unlike strategic review papers released annually by other countries like the US and China. Further, as India’s defence policy is invariably steered in the absence of a policy, the important factor overlooked is the country’s defence preparedness. Look at the paradox. On the one hand, the Prime Minister is showing concern for formidable challenges confronting the country while addressing the commanders’ conference and on the other hand counseling for cutting down on defence expenditure. There has not been any appreciable purchase of major weapons for over more than a decade except for the recent commissioning of an aircraft carrier. Such attributes have their own reasoning. India is a 100 billion dollar market and attracts interest from all great powers including the United States. It is perhaps the major reason for India’s Defence Research and Development Organisation to remain wanting in building indigenous defence capability. Shekhar Dutt, past defence secretary and currently Governor of Chhattisgarh, had thoughtfully remarked that the army must rationalise its appointments and postings to the Ministry of Defence, which remains of short durations thereby giving greater scope to the bureaucracy to push the agendas. It was late KM Pannikar who talked of creating a steel ring around India through the establishment of forward bases in Singapore, Mauritius, Yemen and Sri Lanka. Instead, we have failed badly, giving away turf to both Pakistan and China in the region. The Chinese string of pearls strategy was an offshoot of Britain’s war in the Falklands, which made them learn the importance of carrying provisions along. India stands to contend for a global power status but it demands a massive show of strength, right policies, good governance and effective leadership. Alas, we have lost out on all these variables. It is incredible that despite possessing the third largest standing army, fifth largest air force and sixth largest navy, the country is attacked repeatedly by its neighbours. Interestingly, the larger deficit in handling of strategic issues by India since independence is its inconvincing credibility, notwithstanding the adequate military prowess. India’s soft state attributes must grow its horns not by way of attacking neighbours but by defending itself effectively before being hit or assaulted. It is significant to mention here that the country is in league with all the major and meaningful countries undertaking joint military exercises but, there is a need for strong action to secure the home front. The Indian strategic milieu has certainly changed and so are its attitudinal requirements. It permeates into all areas assumed to build up the country’s comprehensive national power such as political, economic, social and military. Three things which have largely affected the security architecture are -- First, the changing complexion of security in which our increasingly dangerous neighbourhood has not only reduced our geo-political space but, also kept our defence forces in a bind. Second, unusual military buildup and with little being produced indigenously. Third, a buildup of nuclear weapons even as India maintains a no-first use policy and has no corresponding assertive defence policy. We do not have a law to deal with terrorism, whereas insurgency in Kashmir, the northeast and Naxalism remain our primary official threats. Interestingly, India is making efforts to fight terrorism in league with global partnerships. However, one thing that has remained common to the pre and post-cold war period is India’s ceaseless policy of crying hoarse every time but yet never showing firmness in dealing with her security problems. One could only hope that the new government may try to set India’s strategic house in order. We need to read deeply into our adversary’s psyche where power grows from the barrel of the gun and threatens only those with no hold on the barrel. Writing in these columns when the United Progressive Alliance II commenced its innings (“Through Thick and Thin”, June 3, 2009), one was optimistic that the new dispensation would not sit idle whilst the nation’s armed forces continued down a slippery slope. This hope was driven by the belief that the prime minister, Manmohan Singh, who had earlier not shied away from bold decisions, would again not hesitate to look for innovative solutions to save the one institution on which rests the entire security edifice of the nation state. On the morrow of the release of the Congress manifesto for the forthcoming elections, it is appropriate to reflect on how the armed forces have fared against the optimism then expressed by this writer. To put no gloss on it, one must admit that from the earlier slippery slope, the armed forces are now on the edge of the proverbial precipice with only their tenacity and grit holding them from the unknown. And judging by the recent resignation of the chief of naval staff on moral grounds and the vulgar haste with which the government accepted, it would seem that this tenacity has also reached breaking point. In the interim, we have had the spectacle of an open war between a serving army chief and the ministry of defence with the former taking the unusual step of approaching the highest court. The extent of distrust is exemplified by media allegations of a secret military intelligence unit formed by the chief, purported to be snooping on conversations of officials in the ministry, and of unexplained army movements close to Delhi, with unsaid hints of the dreaded word, ‘coup’. Strangely, none of these stories have as yet been satisfactorily explained and put to rest, thus leaving not only a festering wound in civil-military relations, but also a sulking army deeply hurt by the open lack of trust in the institution itself. When two of our soldiers were killed at the line of control and one beheaded by elements across the border, we had the unusual occurrence of emotional outpourings by relatives of the one mutilated when the bodies were brought home, but not one leader of significance was at hand to provide the families and the army with a healing touch. More recently, when five soldiers were ambushed and killed on the LoC, which, according to the army was the work of the Pakistan army, the defence minister told Parliament that they were “terrorists along with persons dressed in army uniforms”, thus offering Pakistan a readymade alibi. In the operational domain there are not only severe shortages in armaments, but modernization is severely handicapped for various reasons, not least because of allegations of corruption, the blacklisting of various companies, and bureaucratic lethargy. A severe shortage of officers in all the three services continues with perhaps the army facing the severest shortages at the operational levels. When allegations of corruption surfaced in the AgustaWestland helicopter purchase, the defence ministry was quick to order an inquiry by the Central Bureau of Investigation and later cancel the contract. But months have elapsed and it is now learnt that the CBI still awaits the president’s nod to question two governors, who, in their earlier appointments, were party to the decision making process. Clearly there appears little urgency to get to the bottom of the case. Let us bear in mind that the case itself came to light not because of a deft effort on our part, but because of investigations in Italy where it is the subject of a trial. Italian prosecutors suspect that kickbacks worth almost $67.6 million were paid to Indian officials to secure the contract. We continue to pay lip service to indigenization and to cast aspersions on the armed forces for their love of imported hardware, but we make no effort to address policy, and structural and management issues that plague our defence research and production systems, which are archaic and not accountable. The issues are all too well known and are the biggest impediments to the introduction of a healthy measure of authority associated with accountability. Indeed, reports of committees like the Rama Rao committee on measures to improve the functioning of the Defence Research and Development Organization, the Kelkar committee on the acquisition process and the enabling of greater private sector participation and the Naresh Chandra task force on reforming the national security system have met the same fate as many earlier such attempts. It is in this bleak backdrop that one was looking for some light at the end of the tunnel in the form of a national security manifesto from the ruling party that would at least provide the institution of the armed forces of India a ray of hope for the future. Sadly it is a disappointment. 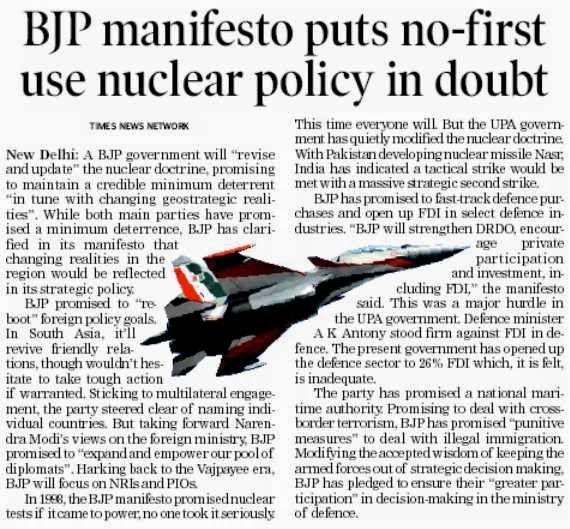 The manifesto lists achievements of having hiked the defence budget from Rs 60,066 crore in the financial year 2003-2004 to a mammoth Rs 2.03 lakh crore in the financial year 2013-2014, of announcing India’s biggest defence modernization plan and giving India the fourth generation plus Tejas and our biggest warship, INS Vikramaditya. It is disingenuous to claim credit for programmes that have been in the pipeline for decades and have had their share of cost and time overruns, amongst a host of other issues. The Tejas MK 1, for example, is still to obtain full operational clearance, which is not due soon whilst the MK 2 is not in sight. The INS Vikramaditya, originally slated to cost around $ 800 million, ended up at some $2.3 billion. Long Term Perspective Plans are periodic exercises and are by themselves no cause for breast beating. The true test is not making plans, but being able to implement them. Here the government’s performance has been patchy at best. Whilst there have been some notable procurements, most of these are through the government-to-government route with the United States of America; when it comes to purchases through global tenders, our lily white consciences balk at the slightest whiff of corruption, thus freezing the procurement system in its tracks. It is hence no surprise that all the three services are on oxygen as far as their modernization status is concerned.The manifesto may try and make the point that the financial year 2013-14 defence budget is a ‘mammoth Rs 2.03 lakh crores’, but this needs to be tempered with the fact that of this Rs.1.17 lakh crore is revenue expenditure, which is needed just to keep today’s armed forces afloat. Inflation, the steep fall of the rupee and rising costs of men and material all add to make the return on what the manifesto terms a mammoth increase, barely modest. That the defence budget as a share of the gross domestic product was a mere 1.79 per cent in 2013-14 and has dropped further to 1.74 per cent in 2014-15 explains why not just modernization of the armed forces, but even current war fighting inventories are under stress. As a point of reference, the strategic community feels that for India this figure should be pegged at 2.5 to 3 per cent.Two other aspects of the manifesto need brief mention. On the strategic front, the commitment to “maintain a credible minimum deterrence and second strike capability”, whilst being laudable, need to be matched with action. If one winds back to the heady days of UPA I’s crowning achievement of the Indo-US nuclear deal and the 123 Agreement and India supposedly having been admitted to the nuclear club, it will be recalled that this came at the heavy cost of India foregoing voluntarily the option for further nuclear tests. The fact that there was a difference of opinion amongst the scientific community at large and between the DRDO scientists and the Bhaba Atomic Research Centre specifically, on the partial success of the thermo nuclear device tested during Pokhran 2 forever leaves a question mark on the credibility of our strategic deterrence. This seems to have been forgotten. 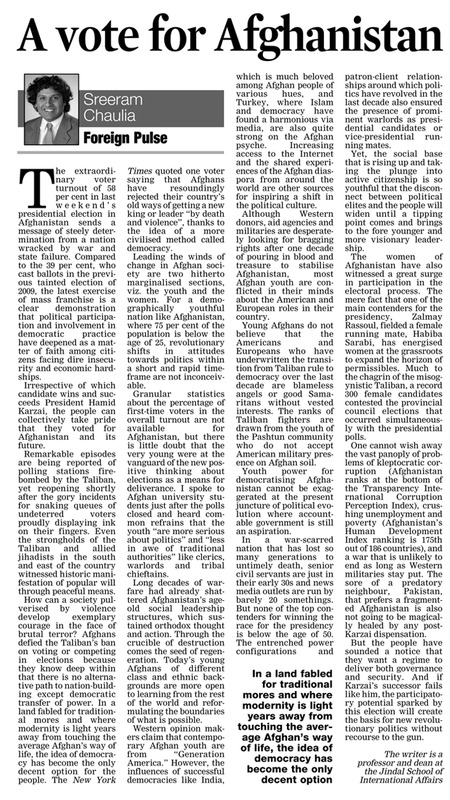 These issues were discussed in these columns earlier (“The Bang and a Fizzle”, September 14, 2009 and “A Nation and its Toothless Nuclear Doctrine”, October 2, 2008). Its time our security managers revisited these issues in the absence of which those we wish to deter are happy for us to live in a make believe world of our deterrent capability! The last is a promise to set up a national commission for ex-servicemen. One has no hesitation in saying that this last decade has seen the worst humiliation of the veterans of the armed forces by none other than their own government. They have been forced to resort to holding public dharnas and returning their medals to their supreme commander who has not even given them an audience. Adding insult to injury, when the Supreme Court issued directions for Pay Commission anomalies in favour of veterans not only has the MOD gone into appeal but on losing, continues to procrastinate in implementing the honourable court’s directive. In another first, the veterans have approached the honourable court with a contempt petition against the MOD, which stands admitted. With this history, any promises made to veterans sound not only hollow, but also look mocking. So much for the manifesto of the party whose one-time prime minister coined the phrase. “Jai Jawan, Jai Kisan”. One wonders what surprises the manifesto of the principal Opposition party now holds for the beleaguered armed forces of India. DEHRADUN: In an embarrassing security breach, a 21-year-old 'mentally disturbed' youth from Punjab snuck into the highly fortified Indian Military Academy campus by scaling its boundary wall late on Friday. The youth, Gunwant Singh, was, however, caught by soldiers on night patrol duty when he was hiding in some bushes on the sprawling academy campus at around 11 PM, police said. The incident comes close on the heels of a threat letter, purportedly sent by terror outfit Indian Mujahideen, to Welham Girls' School warning of serial blasts at several important places in Dehradun between March 30 and April 8. On being caught, Singh, a resident of Sumaan village in Sangrur district of Punjab, was instantly taken into military custody and interrogated at length by all the central and state intelligence agencies. Sources said the Indian Army found that Singh had survived a major accident in Punjab a few years ago after which he reportedly lost his mental balance. He had also run away from home on more than a few occasions earlier, they said. After grilling him for several hours and cross-checking his credentials with the police, Army and central intelligence agencies in Punjab, his military interrogators found nothing suspicious and handed him over to the Uttarakhand police department on Saturday. When contacted, IMA spokesperson Major Prashant Tripathi said the incident was only "an attempt" to breach the foolproof security cover of the IMA. "Our night patrol team diffused the attempt immediately," he said. IMA has always been in the list of top terror targets in the country and the authorities will take suitable measures to ensure that such incidents do not recur, he added. Meanwhile, Dehradun SSP Ajay Rautela told TOI that Singh has been lodged in a police lock-up in Dehradun and his family members have been informed. His father, Jagvir Singh, is expected to reach soon to take his son's custody. The Uttarakhand police is on high alert since they received the threat letter warning "to avenge Muslim killings in Kashmir, Gujarat and Muzaffarnagar recently". A self-proclaimed IM commander, 'Laqui', who had signed the one-page letter, is yet to be traced and the state cops say that until it is proved that the letter was a prank, they would take the threat seriously and remain extra-vigilant. A massive demonstration has been held in central Kashmir, where hundreds of people have gathered to demand an end to the decades-long occupation of one of the most exotic meadows of Kashmir by the Indian army. Spread over a sprawling area of over 150 hectares, the alpine meadow of Tosa Maidan was taken by Indian army on lease for conducting military drills in early 1960s. The lease period is ending on April 18th and there is a growing disagreement against any kind of lease extension. Protesters say this beautiful meadow has been turned into a killing field by the army. Over the years, more than 50 people have lost their lives and many more have been maimed for life after coming in contact with the live and unexploded shells, left behind by army personnel during training drills While the Indian army has sought extension of the lease, people have demanded the state government to oppose the extension or get ready for more protests. Pertinently, the high-level committee set up by the federal government of Kashmir to find a viable solution to the issue has so far failed to resolve the crisis, which also has become a big issue for political parties ahead of polls. As the five-decade old lease of Tosa Maidan to Indian army nears its end, people have mounted a campaign against the possible lease extension, threatening more protests if the lease is not cancelled. Now we should wait and see whether the government will follow popular demand or succumb to the army's pressure. It is little consolation that there was no casualty in the recent incident of fire on INS Matanga, berthed in the naval dockyard in Mumbai. What is worrying is that such an accident had been allowed to happen. Incidents of fire occur only because of use of substandard material or neglect by the staff concerned. The probe ordered will, hopefully, unravel the mystery and help avert such accidents in future. That the mishap is the 14th to affect naval vessels in the recent past is a matter of serious concern to everyone interested in India’s security. Unfortunately, this does not seem to bother those who should be. The inference is to the mandarins in the defence ministry who are supremely unconcerned about the goings-on in the Navy. A month ago when a major disaster struck killing 21 officers and sailors, the Naval Chief, Admiral DK Joshi, was quick enough to own moral responsibility and send in his resignation. The ministry was quicker in accepting his resignation. Even a month after the inglorious incident, the defence minister has not found time to appoint a new Naval chief. In no way can the government justify the delay when all it had to do was to find a successor to Joshi from among those in line. The delay can only be described as wholly unjustified, if not criminal. One of the basic issues that is yet to be settled once and for all is about fixing responsibility for such mishaps. The defence ministry is directly responsible for laying down the defence policy and acquisition of weapons and equipment. The “Rules of Business” of the government of India state that the defence secretary shall be responsible for the defence of India. The only solution to the problem is to give a greater role to the top brass of the Navy, the Air Force and the Army in the decision-making process, particularly in the making of the defence policy and acquisition of arms and equipment. That is precisely what the Naresh Chandra Committee had also recommended. JAISALMER: A day after Army personnel accompanied by battle tanks took possession of a disputed land claimed to be that of former BJP leader Jaswant Singh's son Manvendra Singh in Barmer, the latter's advocate approached the divisional commissioner and filed a complaint against Army action. Manvendra's advocate Dungar Singh told TOI that the Shiv MLA had purchased 8.3 bigha of land from Hajanwala Mehar, a resident of Gehu village, 15 km away from Barmer on April 4, 2011 and this land was sold to Mehar by one Bhawani Singh. He said that Manvendra, after purchasing the land, had filed an application with the sub divisional officer to rectify the revenue record. He said that earlier Army had done fencing in the area, leaving Manvendra's land and other nearby land. Earlier, tehsildars in their spot report had identified the land as that of Manvendra, he said. The state government on May 8, 2013 had ordered the divisional commissioner to resolve the case. The divisional commissioner on July 8, 2013 by giving stay order, had asked to maintain status quo. Advocate Dungar Singh said that on Saturday midnight, nearly 500-600 Army jawans, tanks and other vehicles reached here and they forcefully possessed the land. Apart from Manvendra's land, the army has also taken over 14 bigha of Madan Singh, son of Bhoor Singh, six bigha of Man Singh, three bigha of Sawai Singh and four bigha of another farmer. Meanwhile, condemning the incident, Manvendra said that he had purchased this land and he has the papers of registration too. JAISALMER- Indian Army today testfired an advanced version of 290 km range supersonic cruise missile BrahMos as part of a user trial, at Pokhran test range in Rajasthan. The missile was launched by a mobile autonomous launcher deployed in full configuration with mobile command post at the ranges. "The launch was successful and the missile hit the designated target," defence spokesperson Col SD Goswami said. Senior Army officials witnessed the launch and congratulated the operational team for its successful launch. Both the Army and Navy have already inducted the missile, developed by India in partnership with Russia.